Since, both portable media players are out now. 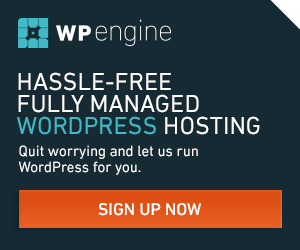 Also the problem of making choice getting difficult, as both has got something new to suit the requirement of individuals. 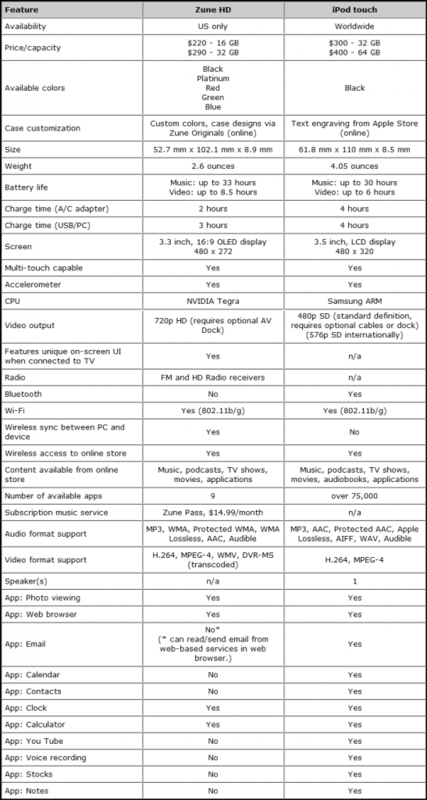 So, why not have a look on comparison chart which I collected from different sources. iPod Nano also got many new features but I decided not to take that in list because of no networking options! Let begin with hardware, iPod Touch has got ARM Cortex-A8 833 MHz underclocked to 600MHz for 3rd Generation, where as Zune HD has got ” Tegra ” which includes an 800-MHz ARM CPU, a high-definition video processor, an imaging processor, an audio processor and an ultralow-power GeForce GPU in a single package. Both of them does not have any camera. Also iPod Touch is in 3rd Generation but Zune HD in 1st Generation. 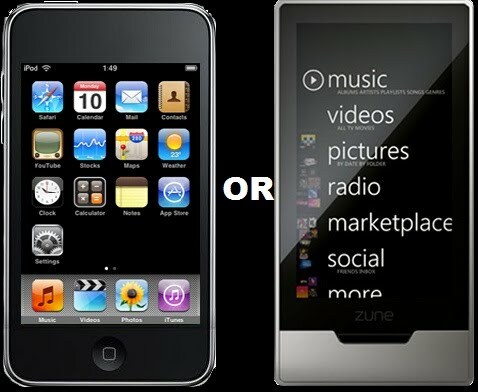 One can easily make out, as iPod Touch is old thats why it has got so many apps., but thats not the case with Zune HD. Further, Zune HD does not have some basic applications like Calender, Notes, E-mail, but I think these will be available shortly through download. Zune HD definitely wins in hardware and battery backup. Finally, Zune HD is available only in US whereas iPod Touch is available throughout the world ! Zune HD has a looong way to go if it has to offer a competition to the ipod touch.The Ipod touch current line up of apps n games are enormous backed up by the iphone and Apple's iStore's huge penetration through out the world.Also the apps released for the Zune HD such as weather update and calculator are way too slow to launch, u'll b done with your calculations already on the ipod Touch Calculator by the time you open the calculator on the Zune HD. no zune hd is better than the ipod in many ways except for not having as many apps as the ipod touch. I think the Zune Hd is better in battery Life than the ipod touch, but the ipod touch does have more apps which Zune hd should have.The Zune does have an E-mail app and also a facebook app .